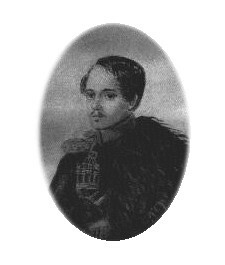 Mikhail Lermontov was descended from George Learmont, a Scottish officer who entered the Russian service in the early seventeenth century. His literary fame began with a poem on the death of Pushkin, full of angry invective against the court circles ; for this Lermontov, a Guards officer, was courtmartialled and temorarily transferred to the Caucasus. With the conspicuous exception of The Angel (1831), the best of his poetry was written during the last five years of his life. The Last House-warming (1840), in which he protests against the transfer of Napoleon's body from St. Helena to the Invalides, is an example of his rhetorical power. He was killed in a duel at the age of twenty-seven. "Forever You, the Unwashed Russia!" "I Come Out To the Path..."
"Not With the Proud Kind Of Beauty"
"On a Bare Hill's Top..."
"The People Of Israel, Cry, Cry!" "Their Love Was So Gentle..."
"We Stood In the Ranks..."
"When, In the Corny Field..."